To Ann Christensen, the great, wide, natural world is just too wonderful not to share. Christensen's passion for the environment has led her on an enduring quest for deeper understanding and appreciation of her surroundings. The inherent teacher in her means that knowledge is promptly shared with others, especially children. "My philosophy is never stop learning," she said. "If you don't keep learning, what else is there? It keeps life interesting." Christensen, of Ketchum, was nominated by the Wood River Land Trust to take a place on the Blaine County Historical Museum's Heritage Court. The nominations recognize women who have contributed to the heritage and history of the county. "In a world when kids can identify thousands of corporate logos but not the trees that grow in their yard, Ann has been an inspirational teacher of the wonders of the wild to generations of the valley's school children," said Scott Boettger, executive director of the Wood River Land Trust. Christensen has for decades maintained a determination to instill a love of the natural environment in children. "I will get these kids when they're little and I will expose them to the wonders of the world and help them love it," she said. Christensen has long walked a path of curiosity, discovery and contribution. "We had a small ranch in the Stanley Basin, and I got hooked on salmon," she said. "I fell in love with the salmon and the fact that they came from the Pacific Ocean through eight dams. That became a huge part of my life." It wasn't her introduction to the natural world, however. Growing up in Kentucky, she was taught by her father to hunt and fish. She eventually turned that exposure to the outdoors into environmental activism. "I was a naturalist and I am an environmentalist," she said. A move to the West Coast expanded her interest as well as her involvement in the environment. She worked as a docent at sanctuaries in northern California and, with her husband, Doug, led backpacking trips for the Sierra Club in the White Clouds. It was the latter experience that helped her family put down roots in Idaho, where she quickly found ways to contribute. "I've always been involved in my community," she said, "but when we moved here, my daughter was in ninth grade in the Community School, so you jump right in when you have a daughter in school." 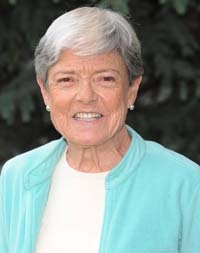 A few years after arriving, she was recruited to be on the board of the Community Library, in 1987. Board members were asked to volunteer at least two hours a week. "One of the things I had done in Marin [County, Calif.], was I had been the frog lady at a preschool, which was a delight," she said. "I kind of missed all that. When I got on the library board I thought, what am I going to do for two hours a week that I really love?" So began Story Hour, now called Science Time, which Christensen created as a way to bring the natural world to preschoolers. She supported her stories with living things, be they plants or animals, mesmerizing the kids. Later, she created an "Ants and Plants" class through College of Southern Idaho for kids in grades 2--6, and led sessions for the Environmental Resource Center, and served on its board of directors. She continued to lend her support to the library, heading a three-year campaign to launch a children's library, which broke ground in 1996. "We raised over $1 million," she said. "That was really important in my life and the library's life." Christensen, an emeritus director on the Community Library board, still seeks out opportunities to improve the world around her, challenging herself and others. "I'd like [people] to consider the environment and conservation issues in every decision that's made," she said. "We have something so special here—if we can't take care of it here, how do we expect people in cities to do any better?" In turn, she's been rewarded with the knowledge that her contributions will make a lasting legacy, one child at a time. "I've learned that most people, once they're exposed to this stuff, love it," she said. "And they love it for the rest of their lives."